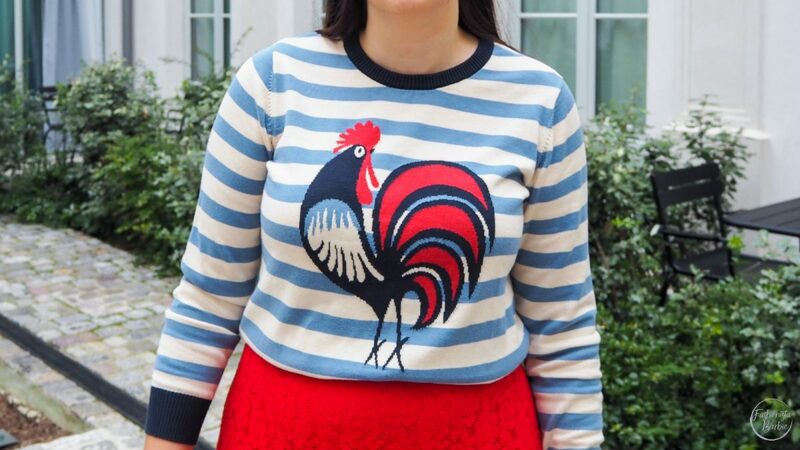 Wearing stripes, blue and red seems so right when in Paris, well to be honest anywhere – but more cute in Paris, and how amazing that I found all that and more in this cute Joanie jumper – seriously how adorable is the Henrietta Chicken or my Henrietta Poulet as I affectionately called her in a very poor French accent during my stay in the City of Lights. Paris feels so much longer than a month ago, I really should make more of an effort to go more often, especially as it is so easy now I’m based in Kent. Enough of my holiday blues, let’s get back to discussing stripes, is there ever a chance that you can ever have too many stripy tops and jumpers? I resisted for many years, I was convinced that a Breton top didn’t suit me, I’m not entirely sure why, I was probably just wearing a size too small. 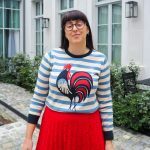 But I’ve made it my mission in life to find the cutest stripy tops and I love this little beauty from Joanie, which is another amazing discovery, I just love its quirky, vintage vibe. I wore this look out to dinner one night, my husband laughed, but after a few cocktails, I think he warmed up to Hennie and he even took some great shots, earning him lots of husband points!!! 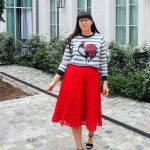 I think this was one of my favourite looks from the trip as it was so me, comfortable-chic, I adore this red lace skirt, a bargain a snapped up in the Asos sale for less than £10 a couple of years ago, and I wore my go-to block heels, which are so needed to navigate Parisian streets, and the colour pops just went so well with the Joanie jumper. Have you discovered Joanie’s cute jumpers? Shot at The Hoxton, Paris, where we stayed and I promise there will be a review up next week – just bookmark the Travel section.